Korea Advanced Inst. of Sci. & Tech. Korean Advanced Inst. of Sci. & Tech. Kunming Univ. of Sci. and Tech. Under thermal environment, Magneto-Electro-Elastic (MEE) material exhibits pyroelectric and pyromagnetic effects which can be used for enhancing the performance of MEE sensors. Recently studies have been published on material constants such as pyroelectric constant and pyromagnetic constant for magneto-electro-thermo-elastic smart composite. Hence, the main aim of this paper is to study the pyroelectric and pyromagnetic effects on behavior of MEE plate under different boundary conditions subjected to uniform temperature. A numerical study is carried out using eight noded brick finite element under uniform temperature rise of 100 K. The study focused on the pyroelectric and pyromagnetic effects on system parameters like displacements, thermal stresses, electric potential, magnetic potential, electric displacements and magnetic flux densities. It is found that, there is a significant increase in electric potential due to the pyroelectric and pyromagnetic effects. These effects are visible on electric and magnetic potentials when CFFC and FCFC boundary conditions are applied. Additionally, the pyroelectric and pyromagnetic effects at free edge is dominant (nearly thrice the value in CFFC in comparison with FCFC) than at middle of the plate. This study is a significant contribution to sensor applications. An analytical algorithm for the estimation of the resistance forces exerted on the dipper of a cable shovel and the specific energy consumed in the cutting-loading process is presented. Forces due to payload and to cutting of geomaterials under given initial conditions, cutting trajectory of the bucket, bucket\' s design, and geomaterial properties are analytically computed. The excavation process has been modeled by means of a kinematical shovel model, as well as of dynamic payload and cutting resistance models. For the calculation of the cutting forces, a logsandwich passive failure mechanism of the geomaterial is considered, as has been found by considering that a slip surface propagates like a mixed mode crack. Subsequently, the Upper-Bound theorem of Limit Analysis Theory is applied for the approximate calculation of the maximum reacting forces exerted on the dipper of the cable shovel. This algorithm has been implemented into an Excel TM spreadsheet to facilitate user-friendly, \"transparent\" calculations and built-in data analysis techniques. Its use is demonstrated with a realistic application of a medium-sized shovel. It was found, among others, that the specific energy of cutting exhibits a size effect, such that it decreases as the (-1)-power of the cutting depth for the considered example application. Sea waves induce significant pressures on coastal surfaces, especially on rocky vertical cliffs or breakwater structures (Peregrine 2003). In the present work, this hydrodynamic pressure is considered as the excitation acting on a piezoelectric material sheet, installed on a vertical cliff, and connected to an external electric circuit (on land). The whole hydro/piezo/electric system is modeled in the context of linear wave theory. The piezoelectric elements are assumed to be small plates, possibly of stack configuration, under a specific wiring. They are connected with an external circuit, modeled by a complex impedance, as usually happens in preliminary studies (Liang and Liao 2011). The piezoelectric elements are subjected to thickness-mode vibrations under the influence of incident harmonic water waves. 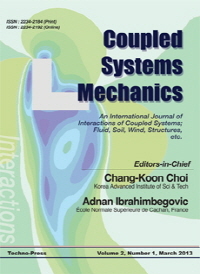 Full, kinematic and dynamic, coupling is implemented along the water-solid interface, using propagation and evanescent modes (Athanassoulis and Belibassakis 1999). For most energetically interesting conditions the long-wave theory is valid, making the effect of evanescent modes negligible, and permitting us to calculate a closed-form solution for the efficiency of the energy harvesting system. It is found that the efficiency is dependent on two dimensionless hydro/piezo/electric parameters, and may become significant (as high as 30 – 50%) for appropriate combinations of parameter values, which, however, corresponds to exotically flexible piezoelectric materials. The existence or the possibility of constructing such kind of materials formulates a question to material scientists. Generally, mass concrete structural behavior is governed by the strain components. However, relevant guidelines in dam engineering evaluate the structural behavior of concrete dams using stress-based criteria. In the present study, strain-based criteria are proposed for the first time in a professional manner and their applicability in seismic failure evaluation of an arch dam are investigated. Numerical model of the dam is provided using NSAD-DRI finite element code and the foundation is modeled to be massed using infinite elements at its far-end boundaries. The coupled dam-reservoir-foundation system is solved in Lagrangian-Eulerian domain using Newmark-B time integration method. Seismic performance of the dam is investigated using parameters such as the demand-capacity ratio, the cumulative inelastic duration and the extension of the overstressed/overstrained areas. Real crack profile of the dam based on the damage mechanics approach is compared with those obtained from stress-based and strain-based approaches. It is found that using stress-based criteria leads to conservative results for arch action while seismic safety evaluation using the proposed strain-based criteria leads to conservative cantilever action. The structural design requirements of an offshore platform subjected to wave induced forces and moments in the jacket can play a major role in the design of the offshore structures. For an economic and reliable design; good estimation of wave loadings are essential. A nonlinear response analysis of a fixed offshore platform under structural and wave loading is presented, the structure is discretized using the finite element method, wave plus current kinematics (velocity and acceleration fields) are generated using 5th order Stokes wave theory, the wave force acting on the member is calculated using Morison\'s equation. Hydrodynamic loading on horizontal and vertical tubular members and the dynamic response of fixed offshore structure together with the distribution of displacement, axial force and bending moment along the leg are investigated for regular and extreme conditions, where the structure should keep production capability in conditions of the 1-yr return period wave and must be able to survive the 100-yr return period storm conditions. The result of the study shows that the nonlinear response investigation is quite crucial for safe design and operation of offshore platform.